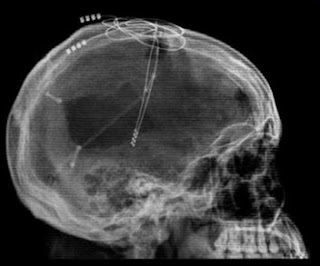 A coma patient, since five years in vegetative state, was able to communicate through a special brain scanner that reads his minds. Patient: What do you think?! Researcher: Outstanding! He still possesses the gift of irony. That’s extraordinary. Write it, miss. Researcher: Dear, do you remember your name? Researcher: Great, again irony! Write it, miss. Researcher: Listen, do you realize you are now talking using the brain? Patient: And do you realize that you’re totally speaking without it?! Researcher: Spectacular, he still has a sense of humour! Write it, miss, please. Researcher: Are you happy that all this time nobody has pulled the plug? Researcher: Mood swings, as I expected. Take note, miss. Researcher: Another curiosity: many people, getting out of a comatose state, revealed that they had particular experiences, such visions of strange entities or dead relatives. Have you ever had something like that? Researcher: Incredible! This time the Nobel is mine! Write it, miss, do not miss anything! Patient: No! You listen. Stop with these stupid questions. You tell me: five years ago, when I went into a coma, in Italy Romano Prodi had just won the elections. Have the centre-left made the law on conflict of interest? Patient: I knew it! I knew! But at least are they working on? Patient: Who is? Massimo D'Alema again?! Patient: Walter Veltroni?! He did not go to Africa? Patient: Excuse me, but who is now Italy prime minister? Patient: What? Is it a joke? Researcher: No, not a joke. What’s your problem, man? 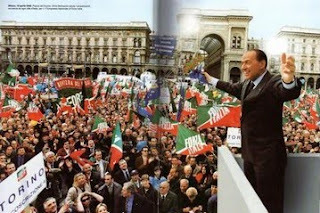 We love Silvio! The researcher goes out indignantly. Patient: What does that mean? Where am I? At Arcore*?! Patient: Who are you? The lady who was taking notes? Patient: Well, please, type this: do not waste your time trying to wake me up. The News: Brain scanner reads our minds.